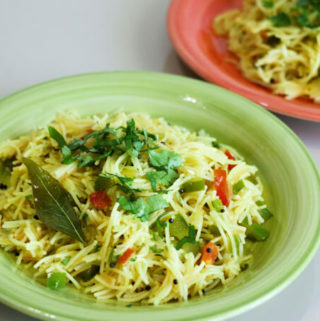 Vermicelli upma is a healthy and quick breakfast recipe. It is made with roasted vermicelli cooked and then stir-fried with vegetables. While upma is originally from South India, it is very popular all over India now. Usually, his go-to breakfast idea is to try something new with eggs, like the spicy stuffed twist to a basic French toast or the all-in-one baked eggs, bread, and vegetable casserole. But this time he wanted to try something traditional. He told me when he went to check the pantry, the first box he opened was vermicelli and he just decided to go with it and that’s how we have vermicelli upma! Depending on how one transliterates Hindi to English, vermicelli is called sevai, or semiya or seviyan in Hindi. We normally use vermicelli for making a dessert pudding called Sheer Khurma which is a vermicelli and dates pudding made for celebrating Eid-ul-Fitr. Vermicelli upma became a common breakfast dish since that day on. Upma is a savory breakfast recipe from South India which can be made with different grains. You can use millets, or even broken wheat to make upma. The recipe is a lot like stir-fry rice or pulao where the rice is cooked separately and then mixed with the sautéed vegetables. Vermicelli: We don’t want vermicelli noodles for the upma but the kind that comes broken in about ½ inch pieces. More like vermicelli rice. Use either rice or wheat vermicelli. Tempering: Curry leaves and mustard seeds are used to temper the oil. Tempering is the most important part of flavouring in the upma recipe. 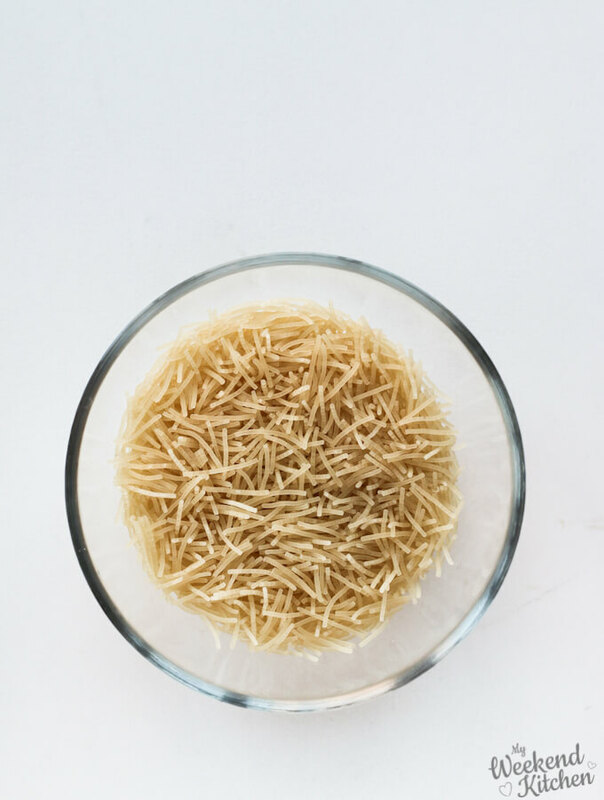 Even if you don’t use any vegetables just cooked vermicelli with the tempering makes a delicious recipe. Seasonal Vegetables: Use your choice of seasonal vegetables, preferably a mix of soft and crunchy veggies. Spices: Just basic seasoning of salt, pepper, and turmeric is what this dish needs. Roast: Pan roast vermicelli for 30 seconds with 1 tsp ghee or oil for vegan preparation. It adds to the overall flavour of the upma. You can skip this step if you are using roasted vermicelli. Cook the vermicelli: Vermicelli cooks a lot like pasta. Bring 6 cups of water to a boil. Add vermicelli and cook on medium flame for about 5-6 minutes with occasional stirring. Drain and keep aside. Temper: Heat oil, temper with curry leaves and mustard seeds and lightly sauté the vegetables in tempered oil along with all the spices. Mix: Mix in the cooked vermicelli. Toss to coat and it’s ready! If you like this recipe, please take a moment to rate it and/or leave your feedback in comments. It will really encourage me to keep exploring, learning and improving. 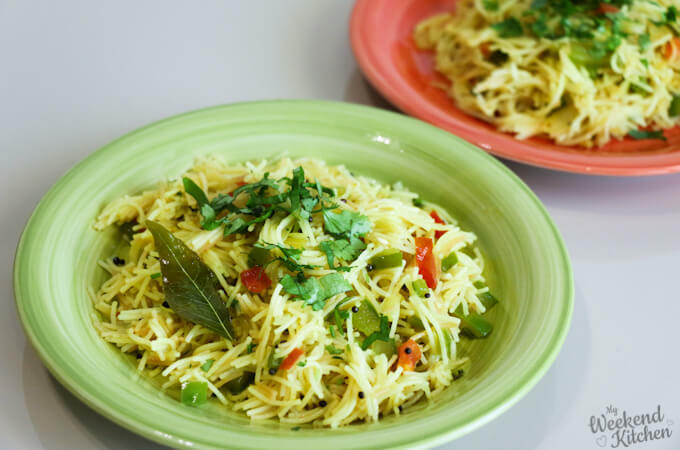 Vermicelli Upma is an easy and healthy breakfast recipe throughout India. Made with rice vermicelli this recipe is gluten-free. Add different seasonal vegetables according to your taste. Heat 1 tsp oil in a pan and lightly roast the vermicelli for just about 30 seconds. Boil 6 cups of water in deep pot. Add roasted vermicelli to the boiling water along with a little salt. Cook for about 5 minutes with occasional stirring until the vermicelli is cooked. Drain and keep aside. Heat the remaining oil in the same pan used to roast vermicelli. Add curry leaves and mustard seeds. Once the seeds start to sputter, add green chilies and the chopped vegetables. Add salt, pepper, cooked vermicelli, and lime juice. Toss everything together and serve hot, garnished with some fresh coriander. *I’ve used only onion and bell peppers in this recipe. If you are using root vegetables like potatoes and carrots add them a couple of minutes before adding onions and peppers so that they get sufficient time to cook through. For a sweet vermicelli recipe check out my traditional Sheer khurma recipe which I learned many years ago from my Pakistani neighbor in Edinburg or a more recent sugar-free Sheer khurma recipe where I sweeten the pudding with only dates and raisins.